If you want to create a website for a small business both WordPress and Squarespace are good choices for your shortlist. But there are significant differences between the two that you should be aware of before deciding. One of the key differences is that Squarespace is very much a ‘closed platform’. You get the features they provide. If they don’t provide something you need there is no way to add it. That said, they do provide a lot of the features that most people need (although you may have to pay more to get them). WordPress is an open platform. It provides a core set of functionality. But you can then add ‘plugins’ to do other things. Right now there are 54,789 plugins available. Which covers pretty much everything you can think of. But even if you wanted to do something that wasn’t covered, you can have your own plugins written (by a programmer). This makes WordPress the much more flexible platform. You can do a lot more with it, and create a lot more different types of website. Which makes WordPress good for small business websites. The other major difference is that Squarespace is the hosting company and software company all rolled into one. That does makes things more convenient. With WordPress you need to buy your own web hosting, and install the WordPress software which comes for free (although installing is normally as easy as clicking a button!). The risk with the Squarespace all-in-one solution is that if things change you pretty much have to go with it. If the price doubles you’re mostly stuck as it’s very difficult to change. 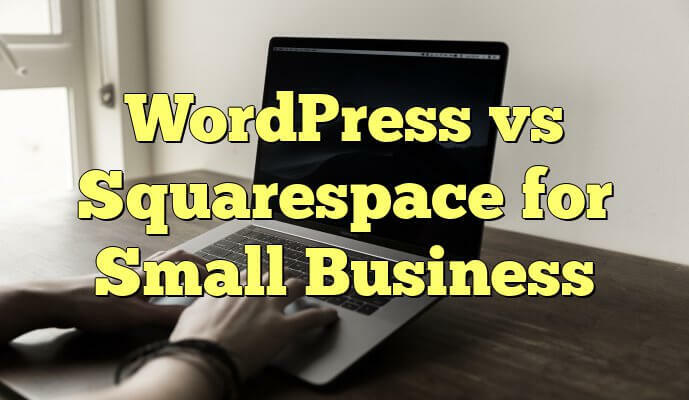 Can You Switch From Squarespace to WordPress? If something goes wrong or things change drastically there is no easy way out from Squarespace. You can export your content, but only in a fairly limited way (it’s actually much easier to get your content out of WordPress). But once you have your content, you can’t just import it into WordPress and have a site up and running. It will lack all the theme and design elements, and all of the custom functionality that is hidden away in the Squarespace code – you just can’t export all that. So you can’t just switch from Squarespace to WordPress, or the other way round. What About Designing The Site? The other major consideration is who will actually design your site? Are you going to do all the work yourself? Both Squarespace and WordPress can produce beautiful responsive websites (see what does responsive web design mean) that get the results small businesses want. But neither platform really wins on this count. Despite the pretty templates, it’s just as easy to make a bad website with Squarespace as it is with WordPress! To make either platform look good (and work well!) does take some design skills. But if you want a professional design, the choices are going to be much more limited with Squarespace. It is a much smaller platform than WordPress – there are 1.8 million Squarespace sites vs 24.8 million WordPress sites. And web designers just don’t like using the ‘closed system’ that Squarespace provide, they find it too limiting. So you’ll have a much easier time finding a WordPress website builder for small business than someone willing to take on a Squarespace site. What Squarespace does, it does pretty well, and can get you up and running pretty quickly. But you need to be clear on what your ambitions for your website are to start with. Because you might outgrow Squarespace fairly quickly, and starting over is a pain in the neck. WordPress will give you a much more flexible platform, that you can expand to do pretty much anything you can think of. But you will probably need at least some technical and design support to make your site look professional, and work well.